Once again Macron is gassing & using brute force against his own people. #Macron's previous Interior Minister, Gerard Collomb, ordered 22 million Euros worth of Tear Gas in 2017. Was he expecting trouble as a result of Macron's disastrous Neoliberal policies? Large crowd of #GiletsJaunes march in the small town of #Aisne, waving French flags. 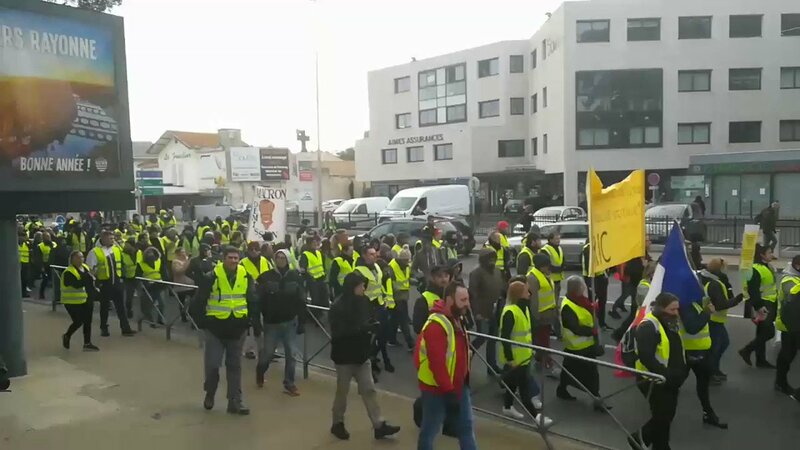 Large numbers of #GiletsJaunes march in #Montpelier chanting "Macron Demission"
Macron is gassing his own people. Where is the international condemnation? 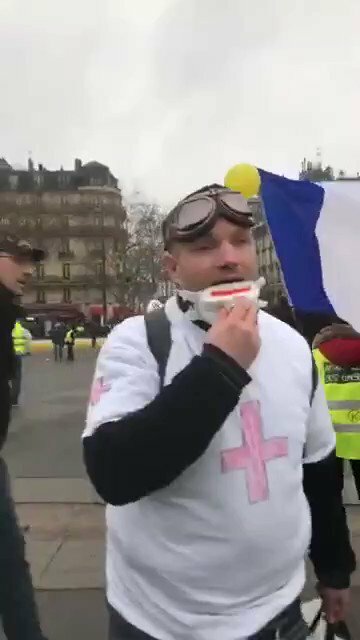 "Do not Kill us, Join us"
Compilation of some of the various #GiletsJaunes protests against Macron's disastrous Neoliberal policies, held throughout France today. There is a near total Western media blackout on these protests today. 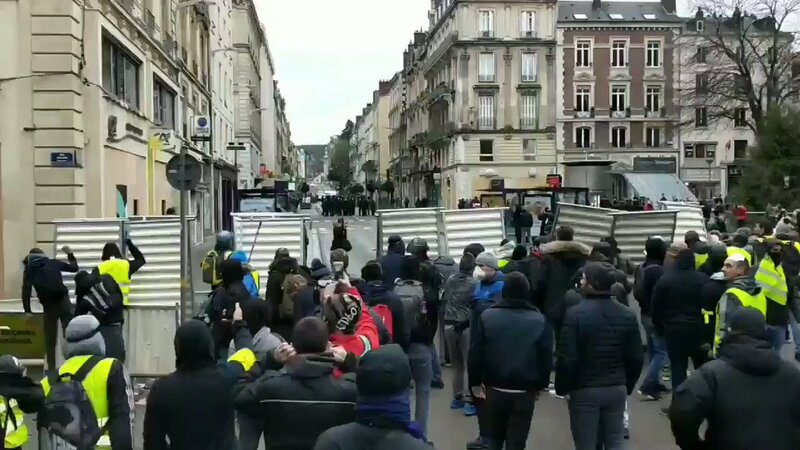 #GiletsJaunes protesters erect a barricade in #Rouen. 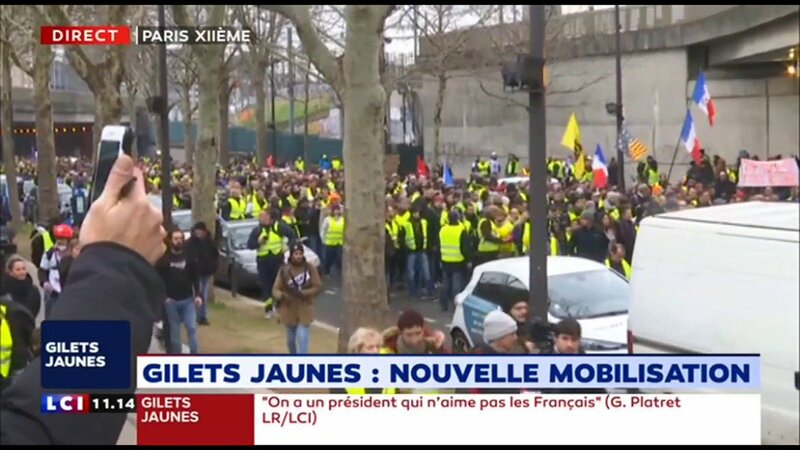 More pictures of the thousands of #GiletsJaunes protesters in #Toulouse today. The Mass Media will deliberately massively under estimate how many people took part in the protests across France today (as they have done previously). Thugs dressed in black attack a bank in #Toulouse. Pics like these will be used by Mass Media to try & denigrate the #GiletsJaunes when over 99% of the protesters are peaceful. Macron will also likely be using Agent Provocateurs. Macron Regime Forces chase #GiletsJaunes protesters in #Evreux. More police brutality when they catch one. Macron Regime Forces are out of control and turning #Paris into a War Zone. ALL of the Neoliberal Globalist orgs strongly support the EU. The aim of the Neoliberal Globalists is to transfer ALL wealth and power to a cabal of anti democracy Oligarchs, Bankers and CEOs. The Round Tables for Global Control were set up by Oligarchs Cecil Rhodes, Alfred Lord Milner and Lord Rothschild around 1900. CFR & Chatham House were created in the 1920's. "A mail before tonight, we're all out for the bright night to begin. Honestly, I'm quite scared. 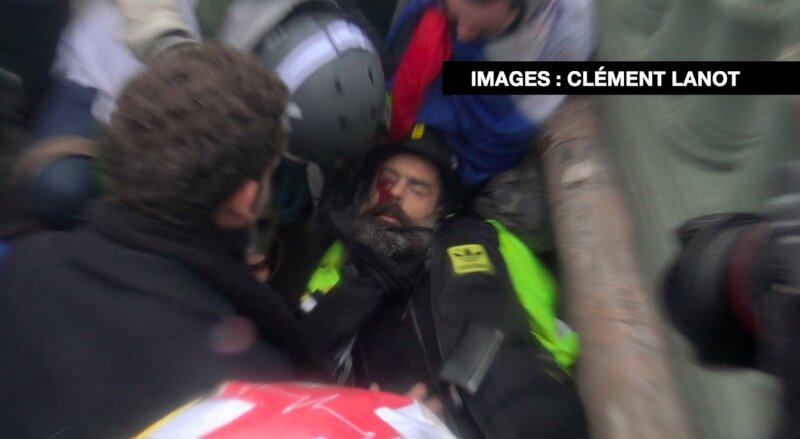 Earlier today, they've hit Jérôme Rodrigues, one of our famous yellow vests, while he was doing nothing but filming yellow vests." He gets attacked at 9:15. It was a shooting at close range (even less than 8 meters away, straight to his face). This is how things are going in France, right now. If you didn't know any better, you'd mistake this picture for wartime. Here's the moment when Jérome Rodrigues (@J_Rodrigues_Off) was severely wounded in battle today. OK SO I’m going to finally start this France Yellow Vests history thread. I spent a few days thinking about how to do this and I finally settled on what to do. This will go at slower than a snails pace, more like a glacier pace. With that said I'll get the link to my PayPal out of the way now. 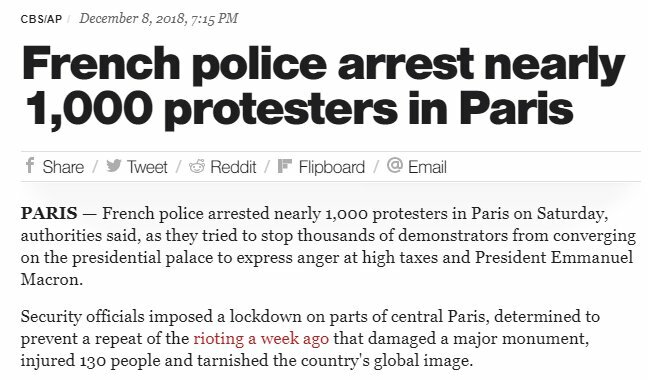 "But you haven't done anything yet"
It's protesters vs. French Leader Emmanuel Macron. Elected in May 2017, the optimism faded to lows of 25% approval by the mid Nov. 2018. Protesters wear Yellow Vests b/c everyone has one by law and it worked to represent their opposition to the Carbon tax. 3. #QAnon's link to Brit Hume's tweet indicates that sweeping and emphatic on-the-record denials caused journalists not to write such a story, but "the McClatchy guys went with it anyway.."
(1) Thread: The Yellow Vest protests in France and elsewhere. (2) It's evening in Paris, and I expect the worst of the violence to occur in the middle of the night. Then, I assume, they will do it all again on Sunday. Currently nearly 1,000 arrested, 50 injured... I am sure the injury numbers are under-reported. (3) I don't support the protests, bc they have passed from protests to riots. They are no longer "peaceful protests." which are the only kind I support, unless you're in a country like Iran at the moment. Yes, the French people have a legitimate grievance.